Soya Oil is designed to be fed according to the following examples. For example, feed a 200-400kg pony approximately up to 150ml (approximately ¼ of a pint) of Soya Oil per day and feed a 400-600kg horse approximately up to 300ml (approximately ½ a pint) of Soya Oil per day. 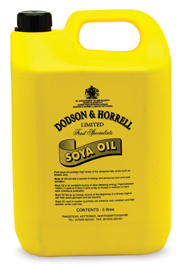 There are currently no questions for Dodson & Horrell Soya Oil for Horses - be the first to ask one!